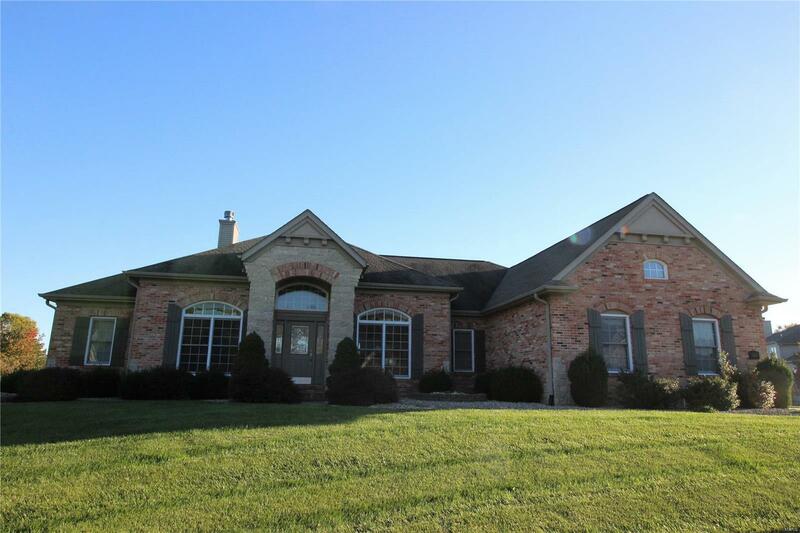 BEAUTIFUL Full-Brick Open Floorplan 4 Bedroom, 4 Bath Ranch w/ Finished Walk-Out Lower Level on Cul-De-Sac Lot Backing to Expansive Back Yards! Upon Entry, greeted by inviting Foyer. Dining Room to right & Study to left. Through Foyer to Gorgeous Great Room w/ White Built-In Cabinets, Gas Fireplace & Back Wall of Windows w/ Remote Control Blinds. Opens to Kitchen, Breakfast Area & Sunroom combination w/ Staggered Maple Cabinetry, Black Granite Island, Desk, Walk-In Pantry & Stainless Appliances. Split Bedroom Plan. Master Bedroom Suite w/ coffered ceiling & Master Bath w/ dual vanities, whirlpool tub, stand up shower & Large WIC. Other side includes 2 additional Bedrooms (w/ WIC's) & Full Bath. Half Bath & Laundry also on Main. Finished Walk-Out Lower Level includes Family Room w/ Awesome Floor-To-Ceiling Stone Gas Fireplace, Wet Bar, Rec Room, Bonus Area, 4th Bedroom, Full Bath & Much Storage. Central Vac, Security & Irrigation Systems. 3 Car Garage, Deck, Patio & Wonderful Backyard!